Some I/O cards have implemented only the first joystick functions: X1, Y1, Switch 1 and Switch 2. Some joystick adapter have +5V output also in pin 8. Potentiometers used in paddles are usually few hundred kilo-ohm linear potentiometers (max. 470 kOhm). Potentiometers are connected between +5V and input pin. The resistance value of the joystick potentiometers are measured using very simple monostable multivibrator circuit, where a small capacitor is loaded through the joystick potentiometer to a certain voltage level. The joystick interface has four this type of monostable multivibrators. Typically joystick interface multivibrators are all in one 558 IC (that IC is like four simplified 555 type timers in one IC) for two joystick ports and 556 (dual 555 timer) for one joystick only port. The bigger the potentiometer resistance value is, the loger it takes from the capacitor to reach the threshold voltage. The time how long it take for each multivibator to reach the logic 1 after the triggering is measued using software and that value tells the resistance of the potentiometer (and the stick position as well because the potentiometer is connected to the stick). This simple method for measuring the resistance value is quite cheap, but not very accurate. 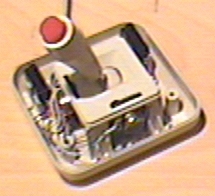 This simple joystick port hardware implementation (originally designed for 4.7 MHz IBM PC) causes many headaches to game programmers (problems of different computer speeds, joycitck port differences, problems in multitasking operating systems etc.). Big tolerances in joysticks and joystick ports mean that the every game must have an option to cablibrate the joystick (which actually means that the program adapts to accept the values in th range which the joystick reading routine does and then converts the values to it's internal format using the values measured in joystick calibration process). When one button is pressed down, that input is grounded which caused the voltage on that pin goes to 0V which means that the joystick interface then gets logic 0 form that input. If you just keep reading the joystick port I/O address contantly, you will get a real-time sate of the button pins. The following circuit diagram is from PCTIM003 document and is Copyright by K. Heidenstrom. This picture is included in this document with permission from K. Heidenstrom. This circuit block diagram applies to all PC joystick interfaces from multi-IO cards to PC soundcards. In PC soundcards the pins 12 and 15 are used by MIDI interface which has it's own electronics separate from the joystick interface. Is there any way to get any output from joystick port ? There is no such function as turning the joystick port pins on/off ever designed to joystick port. Joystick port is designed as input only port. The joystick port does not need the data you send to it (it is simply discarded). The only thing in data write operation which is needed is the data strobe signal (which comes from the ISA bus when data is ready to be read by card) triggers the monostable multivibrators which are used in converting the resistance of the joystick potentiometer to pulse length. When the multivibrators are triggered then in normal joystick poer implementations this causes one side-effect: when the monostable multivibrator is triggered then it discharges the timing capacitor by shorting it to ground for very short time. Then the capacitor is discharged by the monostable multivibrator or is charged by the current from the joystick port there is some current flowing through the joystick potentiometer input pin (that current dicreases over time until the capacitor is fully charged to +5V). So in typical joystick port you can detect some pulses by measuring the current flowing to joystick potentiometer input pin: every time the joystick card is written the current flow into all joystick potentiometer input pins will increase to maximum value (set by external resistor and the internal resistances in the joystick card) and then starts to decrease then time goes on. That's the only way to get anything out of joystick port. Some digital joystick with their own special digital communication protocols use this joystick port feature to send some data and/or syncronization information from computer to joystick. I the beginning there was not ready made BIOS routines for reading joystick in IBM PC. That's why every programmer had to do their own routines. Since IBM AT, joystick routines have been a standard part of BIOS routines. But long time game manufacturers had to use their own routines, because they couldn't rely that the computer had BIOS support for joystick. The BIOS joystick reading function (as many other joystick reading routines) locks out interrupts for more than aroun 1 ms at a time and may cause problem of lost or too much delayed interrupts. When the interrupts have been delayed too much there can be problems with device buffers (buffer under/overflow, break in data transfer or sound playback). For some accurate timing routines when interrupts are missed the time period can be extended. Note that changing the divisor and/or operating mode of CTC channel 0 may break the BIOS's joystick reading functions. Bits 7-4 are valid in the returned value, and they default to '1' and are '0' if the corresponding button is currently depressed. This function does not perform any debouncing on the joystick button inputs. This means that the bit may 'bounce' (i.e. alternate randomly, one or more times) at the instant that it makes or breaks contact, because of the mechanical nature of the switch. This function reads each of the four inputs separately, disabling interrupts for a few milliseconds each time. It may use CTC channel 0 for timing, and if so, its calculations will be affected if CTC channel 0 is operating in a differently than the BIOS has originally set it to operate. For reasl source code examples I would recommend you to check the my JOYTEST program Turbo Pascal sourcecode and the source code for a small library it uses.If you are more familar with C, then check the joystick test program written in C by Jack Morrison. Note that many joysticks return non-linear values, i.e. the value returned at centre-position is not half way between the values returned at corner positions, so most joystick setup programs require the user to set up the centre position as well as the corner positions. It is advisable to use a 10% 'dead zone' around the centre, as joysticks do not always centre repeatably. Joysticks are and joystick sadapters are not high quality devices, and some smoothing on the position values may help if the values are moving around randomly. To read the joysticks (or your slide pot positions), you must first write a byte to port 201h. It doesn't matter what value you send, as long as you perform an I/O write. This triggers the 558 timer on the game adapter. The most machine-independent way to sample the game port is to use a timer. Note the time (e.g., read the countdown register in Timer 0, you need pretty fine resolution and this timer performs 65535 counts every 55 ms) just before you trigger the 558. After triggering, sit in a loop reading port 201h and examining bits 0-3. For those bits that have a joystick pot attached, you'll see them sit for a while at 0, then become 1. As each bit flips back to 1, note the time again. When all bit 0-3 have flipped back to 1, you're almost done. Compute elapsed time for each bit, and you end up with a value that is proportional to pot position. Pots are normally 0-150k variable resistors (0-100k sometimes), and according to the IBM techref, the time is given by Time = 24.2e-6s + 0.011e-6s * R/Ohms. This equation does not accurately represent the real situation, where theare are differences in absolute components values. In reality you have to calibrate the joystick for the application you use. Thse most straighforward way to calibrate the stick for the program isto record the values the joystick gives in extreme positions and in the center position. Buttons can be read at any time just by reading port 201h and looking at bits 4-7. No triggering is required. Button bits are normally 1; while a button is depressed, its bit will flip to 0. More information about accurately measuring time using PC can be found at "Timing on the PC family under DOS" document written by Kris Heidenstrom. That documents comes with example source code also. All this is available in on zip packet at ftp://garbo.uwasa.fi/pc/programming/pctim003.zip. If you simply want to detect whether the joystick is left or right of centre, or above or below centre, and don't want the overhead of locking interrupts for several milliseconds at regular intervals, you could use a fast tick interrupt to poll the joystick port. One idea would be using an interrupt at about 500 us and working cyclically through three states. On one interrupt, trigger the joysticks.On the next interrupt, read the monostable states. On the next interrupt, do nothing. On the next interrupt, you're back to the first interrupt again, so trigger the monostables again. This will give a left/right and up/down indication every 1.5 ms, with a fairly low overhead. I have written an simple joystick tester program which I have found to be useful in many simple electronics tests. The program is a simple DOS test program which shows the information of both joystics easily readable on the screen. The program is useful in testing joysticks and your own project. The program is easy to use. Just download this program and run this under DOS. The program used BIOS routines to read the joystick, so the computer must be at least AT class (286 processor) to be able to run this program. The sourcecode is also freely available for those who are interrested in how to read joytick using Turbo Pascal. You need binary.tpu to compile the program so take also the binary tpu source code. For those who prefer C can check the joystick test program written in C by Jack Morrison. PC Game Programmer's Encyclopedia has a good Programming the PC Joystick article which includes technical info and source code in Turbo Pascal and Assembler. Good assembler josytick reading routine examples can be found at PCTIM003 FAQ / Application notes: Timing on the PC family under DOS. In Windows there are few different ways to read joystick. For Visual Basic programmers one polssibility is to use Lib "winmm.dll" calls joyGetPosEx and joyGetDevCaps. In modern games joyticks are read using DirectX gaming API. DirectInput part of DirectX provides functions for reading various game input devices including joysticks. DirectInput is nowadayd the recommended API for game controlling devices over the current standard API functions because it support for more types of devices and faster responsiveness Microsoft� DirectInput� provides an interface for a variety of input devices (joysticks, headgear, multi-button mice, force-feedback joysticks etc.). By working directly with device drivers, DirectInput bypasses the Microsoft� Windows� message system. Moving Your Game to Windows article series describes keyboard, mouse and joystick inputs. Moving Your Game to Windows, Part II includes the joystick programming information and includes source code for it. You can also find information from May the Force Feedback Be with You: Grappling with DirectX and DirectInput article from Microsoft Systems Journal. The joystick reading itself is done by reading /dev/jsn where n is the joystick number. A read operation on /dev/jsn will return the struct JS_DATA_TYPE. Linux Joystick Driver has a web page at http://atrey.karlin.mff.cuni.cz/~vojtech/joystick/.